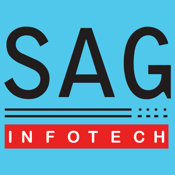 GET READY TO VISUALIZE "SAG INFOTECH"
Its an free application,by downloading it anyone can see all the information of the company. EASY WAY TO GET RID OF BROWSING. 2.INFORMATION REGARDING THE PRODUCTS WE PROVIDE. 4.INFORMATION OF OUR PRECIOUS CLIENTS. 5.INFORMATION OF OUR ORGANIZATION CURRENT LOCATION.